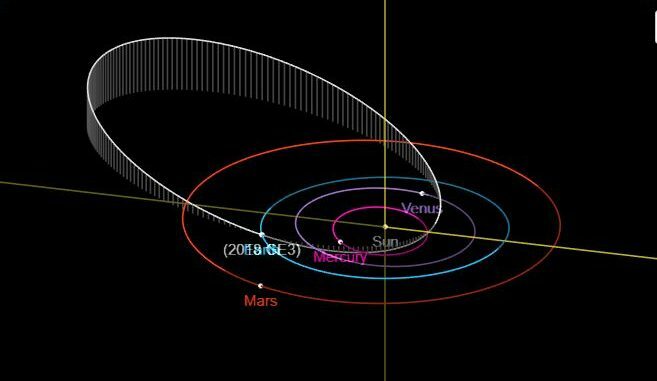 An asteroid comparable to the to the asteroid that exploded in the Tunguska region of Siberia in 1908 buzzed past the Earth on Sunday 15, April just one day after its discovery by astronomers at the Catalina Sky Survey. The asteroid designated 2018 GE3 reached closest approach to the Earth at 06:41 UT/GMT at a distance of just 119,400 miles or around the halfway point between the Earth and Moon. NASA estimate the asteroid to be between 48 to 110 meters in diameter which makes it even larger than the object that exploded over Siberia 100 years ago flattening 2000 square kilometers of forest (thought to be around 60m in diameter). 2018 GE3 is also up to six times larger than the more recent 20km meteor that exploded in the sky over Chelyabinsk, Russia in February 2013 causing damage to around 7200 buildings and injuring almost 1200 people. Michael Jäger, Austria took this video of the 13th magnitude space rock passing through the constellation of Serpans. What are the risks of future impacts? This object was discovered a mere 21 hours before closest approach and goes to show that there are still medium-sized asteroids with orbits within close vicinity of the Earth that are yet to be discovered. As a somewhat more reassuring fact, NASA estimate that over 90% of near-Earth objects larger than one kilometer have been detected and are being monitored. The NASA NEO survey science definition team (SDT) determined a cut-off point of 460-foot (140m) whereby impacts from objects of this size would only cause regional effects rather than larger sub-global effects. A not so comforting statistic is that less than 50% of these objects have been discovered based on the estimated population of asteroids of this size.